Katie skidded to a halt in her low top sneakers. Gasping in exhaustion and shock, she surveyed a traffic jam of hastily abandoned cars. She caught her breath and found no persons living or dead amid the destruction her eyes beheld. With a jump, the fifteen-year-old in pink leggings slid across the hood of the crashed taxi blocking the sidewalk. The vehicle had fared better than the ones crushed in the street. Stomped flat, many still squawked out alarms to form a cacophonous chorus. She dashed under a toppled streetlight, then felt a tremble before a mixture of distant screams and collapsing masonry echoed through the avenue. With a gulp, Katie weaved between demolished cars to cross the street, and a plume of grey dust rose above the buildings ahead of her. “Um… Yes?” he replied over the noise. “I’ll be there in a sec’,” he replied before the sonic blast from his Banshee Gun topped out her phone’s volume. The sensor pod of an alien robot faced her with sudden, insectine precision. Unable to stop her run without crashing into it, Katie’s phone clattered onto the pavement. She dropped and slid under the four legs of the arthropod machine. Its bladed forelimbs slammed down as Katie screamed, but missed by inches before her dive left her lying face-up behind the wardrone. She scrambled to her feet as the Kitzillaki robot spun around, then jumped back as a lateral swipe of drone’s claw nearly eviscerated her. Instead, the slash sliced through her bag. Its contents spilled onto the street. Katie ducked a second swipe, and being forced backwards she avoided impalement with a nimble dodge. Then her heel hit the unseen curb behind her and she fell onto her rear. Sitting stunned on the sidewalk, she watched the alien machine raise its bladed appendages. But before it could strike, there was the sudden foosh of extradimensional gas. 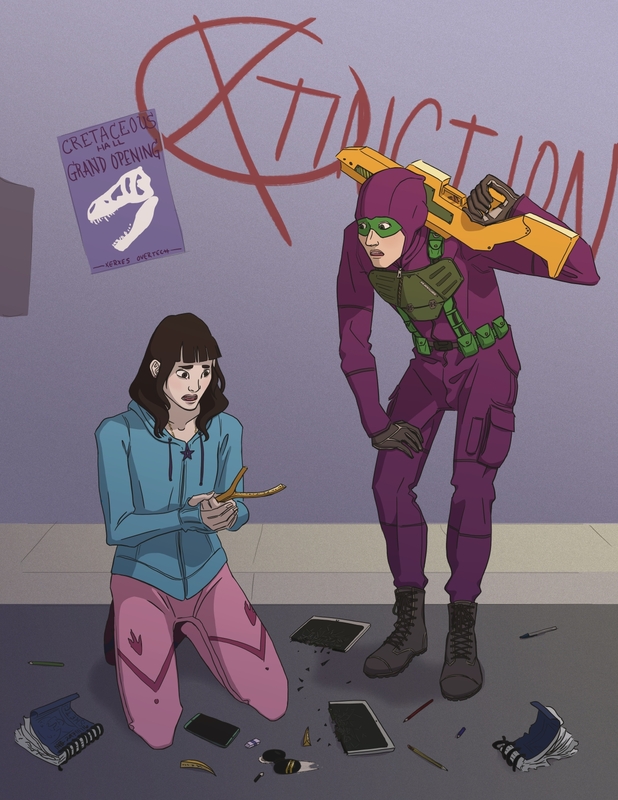 The barrel of the Banshee Gun emerged from a purple cloud behind the robot, and its hyper-sonic wail parted the fumes to reveal The Phantom after his teleportation. The gun blasted the Kitzillaki wardrone square in the back, focused acoustic resonance paralyzing the robot instantly. Katie plugged her ears to protect them from the intense noise, and watched the robot vibrate and spark until it smoked and toppled over. Phantom stopped what he was doing and looked to her. Phantom jogged over, and standing over Katie followed her near tearful gaze to a wishbone-shaped object on the blacktop. The size of a hand mirror and made of a pale golden metal, its forked points above the handle had been sheered off at uneven angles. Cretaceous Queen Artwork by Madicienne! Click here for her website featuring art, writing and more! Katie reached under the collar of her shirt and unhooked a smooth amber ellipse that hung from her necklace. Wiping her eyes, she placed it between the broken forks of the Oricana and tried to hold them together. The sigil scribed at the heart of the amber glowed faintly, then faded. Phantom sank down on his haunches, eyes framed by his mask and studying the magical artifact. His gloved finger traced out its shape. Then he scrutinized the flowing lines of the sigil within the gemstone between the severed forks. Focused on disassembling the gun, he unscrewed a component. “Is there a thumb sized depression on the grip of your Oricana?” he asked without looking up from his work. He pulled an object out of the gun that looked like a thick tuning fork of pale golden metal. He offered it to Katie, and her eyes widened at the sight of an amber ellipse wired into its hilt. A Saurian sigil pulsed within it. She plucked her own amber stone from the ground. “The sigil’s almost the same as mine.” Katie took the induction core from Phantom, then placed the gemstone between its narrow forks. There was a spark, and her fingers let go to leave it floating. He smiled as they stood. Chapter two of Cretaceous Queen, Urruatta, will be released next Saturday! Stay tuned, true believers! “Cacophonous chorus.” Love it. And I really like your chapter title! Thanks Deby! Getting the right amount of exposition in without hurting the pace was the tricky part in this chapter.